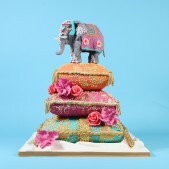 Inject some serious fun into your wedding celebrations – choose a novelty wedding cake! These fabulous and fun creations are custom made just for you; they can reflect a particular theme or a favourite joint hobby. 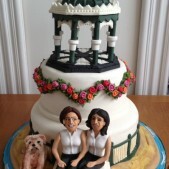 Why not let us design sugar models of the wedding couple to sit on top? 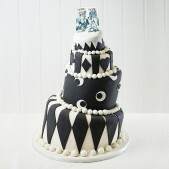 We can also create wacky wonky wedding cakes – let your imagination run wild! View our gallery for inspiration. 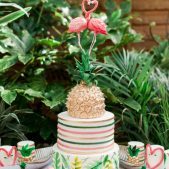 As a leading London wedding cake designer and with a renowned reputation for producing unique and show stopping novelty wedding cakes, Cakes by Robin are the place to come to for true one-off novelty wedding cakes as an unforgettable centrepiece to your special day. 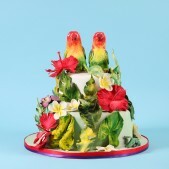 Why have a traditional wedding cake when you could have a novelty wedding cake that reflects you and your partner’ personalities, interests, style and sense of humour? 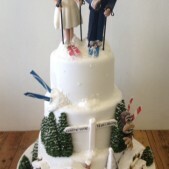 Add a light hearted slice of fun to your Big Day and let Cakes by Robin create a novelty wedding cake especially for you. 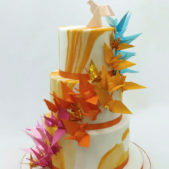 We have many years’ experience in designing the most exquisite, bespoke cakes for any occasion. 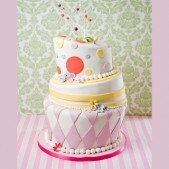 Every cake we design is driven by our passion for originality, creativity – and deliciousness! When it comes to wedding cakes, Robin has done it all – from traditional white wedding cakes to artistic and contemporary wedding cakes, miniature wedding cakes, wedding cupcakes and, of course, novelty wedding cakes. Our wedding cakes have graced the most spectacular wedding celebrations at some of the most luxurious London venues including Claridges, The Mandarin Oriental, The Four Seasons, The Ritz, The Hurlingham Club, The Bingham, Kew Gardens and Cannizaro House, to mention just a few. 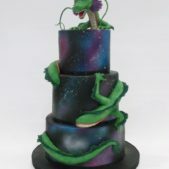 Novelty wedding cakes are contemporary creations that are becoming increasingly popular as the bride and groom look to add a unique element to their wedding day. 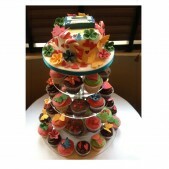 Fun wedding cakes can take any form, theme or style. 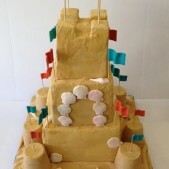 The creative team at Cakes by Robin can create handcrafted sugar models to top any cake. 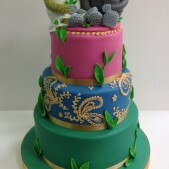 At Cakes by Robin, each of our beautiful cake designs is custom made to your specifications – the only limit is your imagination. 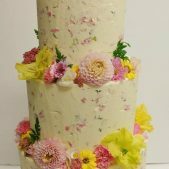 Let us know your ideas for the one-of-a-kind novelty wedding cake of your dreams and book an in depth consultation with Robin to share your thoughts for your Big Day. With Robin’s creativity and attention to detail, you’ll see the ideas come together as we work with you to make your wedding wish come true. 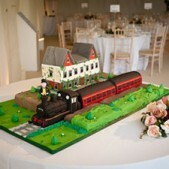 See a selection of our most favourite novelty wedding cakes and view our Wedding Gallery for further inspiration. 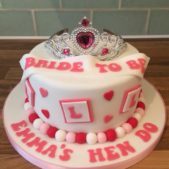 Each bespoke novelty wedding cake is created with the freshest possible ingredients and is available in a range of delicious Flavours and Fillings including Red Velvet, Chocolate Fudge, Vanilla Victoria, Coffee & Walnut and many others. We are happy to cater for many special dietary requirements, including Gluten Free novelty wedding cakes so that everyone can enjoy a celebratory slice of wedding cake on account of a food sensitivity or dietary preference. 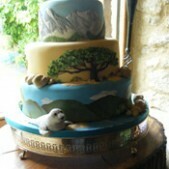 All our bespoke wedding cakes are design at Cakes by Robin’s studio in South West London. 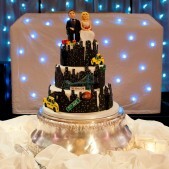 If you wish, you can have your novelty wedding cake delivered directly to you on your designated day. 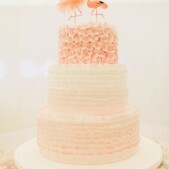 For full delivery details, please visit our Cake Delivery. For more information about how Cakes by Robin can create the novelty wedding cake of your dreams, simply call our team on 020 8874 4616 or fill in the form here. If you wish, you can also visit us in person. Our Cakes Parlour is only a short stroll from Southfields Underground Station in Wimbledon SW18 and we’re open every day, serving a scrumptious selection from our ready-to-eat collection of patisserie cakes, cupcakes and miniature cakes. Why not discuss your ideas for a novelty wedding cake with one of our professional cake designers and place your order in person?